First, there is only one God. He is the God of Abraham, Isaac, and Jacob (Exodus 2:24). He is the Creator of all things in heaven and on earth. There is no other god. We understand these facts from the Hebrew Bible (Tanakh) which consists of the Torah (Five Books of Moses), Nevi'im (the prophets) and Ketuvim (the writings), in other words, the 39 books of Old Testament. All three major religions, Judaism, Christianity, and Muslim agree that the Old Testament is God’s Word, a revelation of Himself to mankind although Muslims claim that the Old Testament has been corrupted. 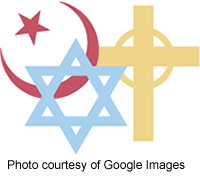 Of the three major religions, Judaism came first. It began with a covenant between God and Israel, revealed through Moses more than 3,000 years ago (Exodus 19:5-6). This is known by Christians as the Old Covenant. Isaac was one of the sons of Abraham. Abraham had another son, Ishmael, who was illegitimate since he was born to Abraham’s slave women, Hagar (Genesis 16:15). Muslims claim Ishmael to be the father of their religion. Until the Muslim prophet, Muhammad came along (570-630 AD) Muslims worshipped about 360 different pagan gods, one of them was Allah. Muslims at that time, did not worship the God of Abraham, Isaac, and Jacob. But Muhammad was not happy that the people were worshipping so many pagan gods, so he proclaimed there is only one god, Allah, who was the moon god. To this day, Muslims worship Allah, claiming that he is the same God as Abraham, when in fact he is one of the many false pagan gods. Therefore, the Muslim god is not the God of Abraham, Isaac and Jacob. See Where Did Allah Come From? and Allah - The Moon God and Hubal and Allah the Moon God? for more information. Christianity is the logical progression of Judaism. The Old Testament prophets foretold the coming of the Messiah, and more than 2,000 years ago, Jesus Christ fulfilled every prophecy concerning His Arrival. We understand these facts from the 39 books of the Old Testament and the 27 books of The New Testament of the Bible, which orthodox Jews do not accept as the Word of God. Muslims believe in Jesus Christ, but only as another in a long succession of prophets. The New Testament reveals the life, death, and resurrection of Jesus Christ, as well as the New Covenant, which orthodox Jews also reject. Unlike the Old Covenant, which was an agreement between God and the Israelites and came with conditions, the New Covenant was established by the death and resurrection of Jesus Christ, given to all people, without conditions. Belief in Him, trusting in His ability to save you from your sins, confessing and turning away from them and living according to His ways is sufficient to be considered a child of God. Orthodox Jews have long awaited the arrival of the Messiah. Unfortunately, Judaism still exists today because they reject the notion that Jesus Christ has already come. True Christians follow the teachings of Jesus Christ of Nazareth as He is revealed in the Bible, Old and New Testaments. Christianity should be the only religion for the human race today, its origin being the only True God as revealed in the Bible. The God of Abraham, Isaac and Jacob is the same God of the Jewish people as well as Christians, and should be for Muslims as well since Ishmael was a son of Abraham. Jesus Christ claimed to be God, which led to His crucifixion. The Jewish people did not recognize Him as their promised Messiah, therefore Judaism still exists today. Muslims went entirely their own way, claiming Allah is the same God of Abraham, but can easily be disproved by historical facts. There is only one way to God, the Father, and that is through God the Son, Jesus Christ. All people must know that truth.